More than 100 countries voted for a UNGA resolution last year to start discussions, with Austria, Brazil and Ireland leading the effort. UNITED NATIONS: An U.N. talks aimed at banning nuclear weapons began Monday, but the United States, Russia, China and other nuclear-armed nations are sitting out a discussion they see as impractical. Supporters of the potential pact say it's time to push harder toward eliminating atomic weapons than nations have been doing through the nearly 50-year-old Nuclear Non-Proliferation Treaty. With international tensions rising while public awareness of the nuclear threat has waned, "the need for progress on nuclear disarmament has rarely been as urgent as it is today," U.N. Under Secretary-General for disarmament Kim Won-soo said as the talks opened. More than 100 countries voted for a U.N. General Assembly resolution last year to start discussions, with nations including Austria, Brazil and Ireland leading the effort. But the U.S. and several other nuclear powers say a ban won't work and the world should instead stick with a more gradual approach. "As a mom, as a daughter, there is nothing I want more for my family than a world with no nuclear weapons. But we have to be realistic," U.S. Ambassador Nikki Haley said as she and colleagues from Britain, France and about 20 other nations gathered Monday outside the General Assembly chamber to show opposition to the talks starting inside. Haley argued that a treaty would end up disarming nations "trying to keep peace and safety," while "bad actors" wouldn't sign on or comply. "North Korea would be the one cheering, and all of us and the people we represent would be the ones at risk," she said. North Korea carried out two nuclear tests last year and has continued to test ballistic missiles as recently as this month, in violation of U.N. resolutions. The North has said its nuclear efforts are meant as a deterrent against what it sees as U.S. hostility. North Korea's U.N. Mission didn't immediately respond to an inquiry Monday about the disarmament talks. Opponents of the ban plan say gradual disarmament has made a difference. 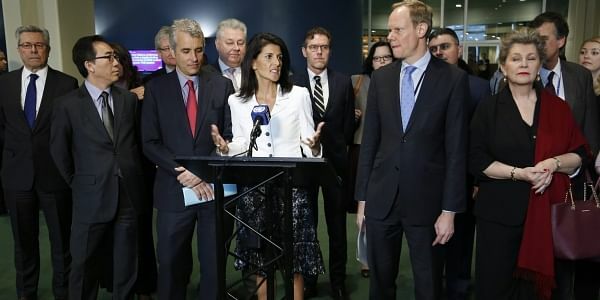 The U.S. has reduced its nuclear arsenal by 85 percent under the Non-Proliferation Treaty, Haley said; Britain has cut its nuclear forces by over 50 percent since the height of the Cold War, according to Ambassador Matthew Rycroft. Still, "our countries continue to rely on nuclear deterrence for security and stability," French Deputy Ambassador Alexis Lamek said. Chinese and Russian representatives didn't join the boycotters' news conference, but the two countries had said previously that they wouldn't participate in the talks. Japan â which during World War II experienced the only atomic bomb strikes in history â did take part in opening remarks Monday. Saying that North Korea's actions challenge the non-proliferation approach, Japanese representative Nobushige Takamizawa said it was "crucial to have a realistic perspective as to how nuclear disarmament measures can contribute effectively to addressing actual security concerns." The negotiations aim to create "a legally binding instrument to prohibit nuclear weapons, leading towards their total elimination." Backers hope a document will be inked by July. Any treaty would bind only nations that ratified it. But despite the opposition from key nuclear players, supporters of the proposed ban feel it could help create a new international norm of rejecting atomic arms. "It's very difficult to eliminate a weapon that you haven't prohibited first," said Beatrice Fihn, the executive director of the International Campaign to Abolish Nuclear Weapons, an advocacy group.